Please review the Bronze Award page on the GSWNY website. Please send a copy of the bronze award reporting form to the Court of Awards. Bronze Award reports are due to the Court of Awards Committee by March 31 of each year in anticipation of the June Court of Awards. Court of Awards is a Pittsford Service Unit Awards event, and NOT a GSWNY Council event. Please contact your Service Team with questions. In order to participate in the June Court of Awards ceremony, the Pittsford Service Unit imposes a March 31 deadline for all Gold, Silver and Bronze awardees. The purpose of this deadline is to give the committee enough time to secure official congratulatory letters (from local and state officials and schools, for example), plan the ceremony and to print up invitations and commemorative programs that list all of the awardees and their projects. This takes significant time. It also impresses upon the girls the necessity of meeting a deadline especially if they choose to pursue Silver and Gold. If your scout will finish the project by March 31 and leaders can sign off on their final project report by March 31, your scout should rightfully receive her pin at that June ceremony. It is those reports that are important to the work of the committee for the Bronze awardees. If your girls have not completed their Bronze Award requirements, and sent the packet to the Court of Awards Committee by March 31, they should plan on receiving their recognition and attending the Court of Awards Ceremony the following year/June. Girls who finish their project by September of their 6th grade year can return for the following June Court of Awards to receive their pin. All girls in a Troop need not have completed the project and receive their Bronze Award at the same Court of Awards ceremony. The Service Unit has many Troops with girls that do not all receive their Bronze, Silver or Gold awards at the same Court of Awards. All the girls in the Troop attend the awards ceremony to support their fellow girl scouts, even if they are receiving their award the following year, or have received their award the previous year. Many awardees, including gold awardees, return the following year to receive their award at Court of Awards. Why? The ceremony is truly a special event and the girls take great pride in receiving their hard earned pins in front of town officials, family, friends, fellow Pittsford Girl Scouts, leaders and Council members. Please review the Silver Award page on the GSWNY website. 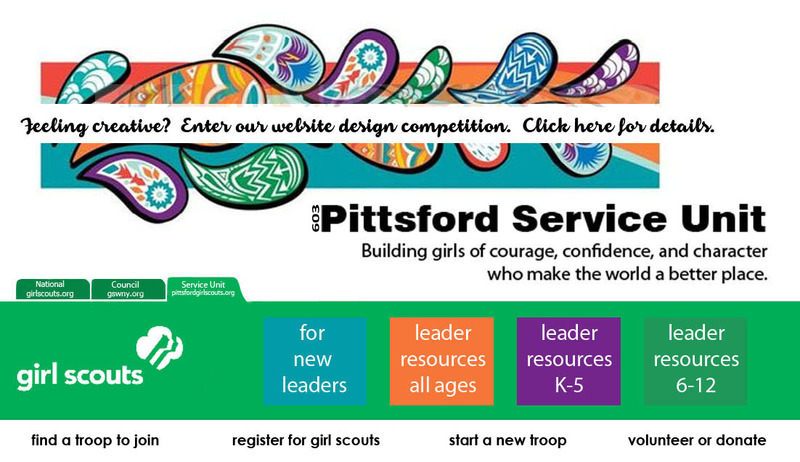 If your troop has girls planning to do a Silver Award project, the girl(s) need to present project ideas to the Pittsford Service Team. This presentation will provide support and guidance for the girls, and will give them the experience of presenting to a group of adults, as they will need to do for the Gold Award. Silver training is not required, but strongly recommended. Prerequisite work can start in 6th grade. Girls will be recognized in the Pittsford Award ceremony the following June. However, to be recognized in the Pittsford ceremony in the June of the 8th grade year, paperwork needs to be submitted by March 1. If the girls have not completed the project and paperwork in by 9/30 of their freshman year, they cannot receive the award. Please review the Gold Award page on the GSWNY website. The adult recognition committee needs your help. We present two kinds of awards at the end of the year. Please let Lisa Gustafson know if you can help. The first award is the Years of Service Pin. These are given in five year intervals for your adult years as a Girl Scout volunteer even if it was in another Girl Scout service unit. All you need to do is let Lisa know when it is five, ten, fifteen, etc. years. There will be a sheet to sign up at the spring service unit meeting or you can e-mail Lisa. If you are a year or two past and we have not presented you with a pin, let her know and we will include you this year. The second award is the Volunteer of Excellence Pin. This needs one person to nominate and two more people to write letters of endorsement. The form is on the GSWNY.org website under Forms, Adult Recognition. There is a second form for the endorsement letters. Let Lisa know who you plan to nominate so we don't duplicate efforts. Lisa can help fill in some of the data needed. All paperwork needs to be in to Lisa Gustafson by June 1 so we can present the awards at Leader-Daughter later in June. Once a year at a service unit meeting we ask all leaders and co-leaders to update a volunteer record sheet. We need to know your training and your positions so we can present these awards. The forms related to Adult Recognition are found on the GSWNY website by searching for adult recognition. Pittsford Volunteer of Excellence Awards - Click on highlighted years to read more about our winners! 2019 -- This could be you! Volunteer today! The Pittsford Service Team is always looking for adult volunteers to join our team! Contact any member of the Service Unit Team for information on how you can get involved.